We recommend that you DO NOT purchase tickets via Viagogo. 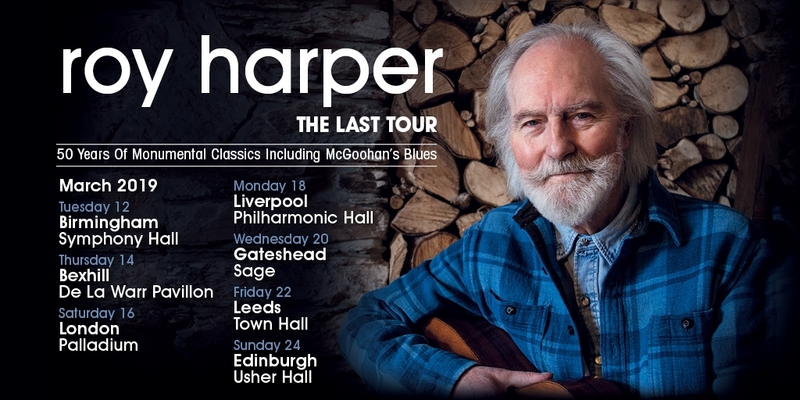 ROY HARPER - 75TH BIRTHDAY CELEBRATION TOUR!! UPDATE... Bill Shanley, who played wonderfully on my last album 'Man & Myth', will join me on stage in September. I'm really looking forward to playing with him again. I’m also very happy to have Irish duo Ye Vagabonds performing the opening set for these shows. They remind me of my first days at ‘Les Cousins’ in Soho in 1965, where the majority of those turning up to play were from all corners of these islands. It struck me then, and it’s probably still true now, that of the four traditions, Scots, Welsh, Irish and English, the Irish was the most preserved. Perhaps the truest to it’s everyday life. I propose that Ye Vagabonds are a modern expression of a tradition that is truly robust and important to these islands. I’ll be enjoying that vibe echoing around the back stage hallways. Three special shows in October 2013 with string and brass ensemble to showcase the new album 'Man & Myth' as well as a few of the old favourites. UPDATE... Jonathan Wilson, co-producer of 'Man & Myth', has been added to the bill and will join Roy on stage in October. Jonathan will be performing a solo acoustic set to open each show, and will accompany Roy throughout the rest of the evening. This, along with the string and brass arrangements by Fiona Brice, plus a few old favourites, will make for a very special show indeed.